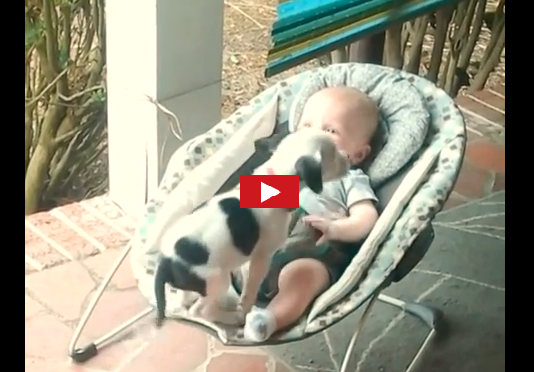 Pitbull Puppy And Human Baby Cuddle Together. It Doesn't Get Any Cuter Than This. Babies are cute and so are puppies. Put them together and the cuteness overloads. Brandi Leigh Hodges of North Carolina in the United States has taken a beautiful video of her pit bull puppy cuddling with her baby daughter Eisleigh. The puppy which the family named Clyde is shown in the footage slowly jumping on the baby's crib and nestling beside her. It's one of those moments where you'd go awww and wish of having a pit bull puppy. It's a beautiful video that will surely help in taming down the rather nasty reputation associated with pit bulls. Eisleigh's family has also taken several photos of the baby and puppy hanging out. You can see some of them here.